RSS isn’t as hip as it was during the days of Google Reader, but I still launch a feed reader every single day. It helps me keep up with the latest technology news and ensures that I have a steady stream of independent content to read from my favorite weblogs. Twitter can function in many of the same ways, but I prefer to keep my social network as a platform for communication rather than a news gathering service. 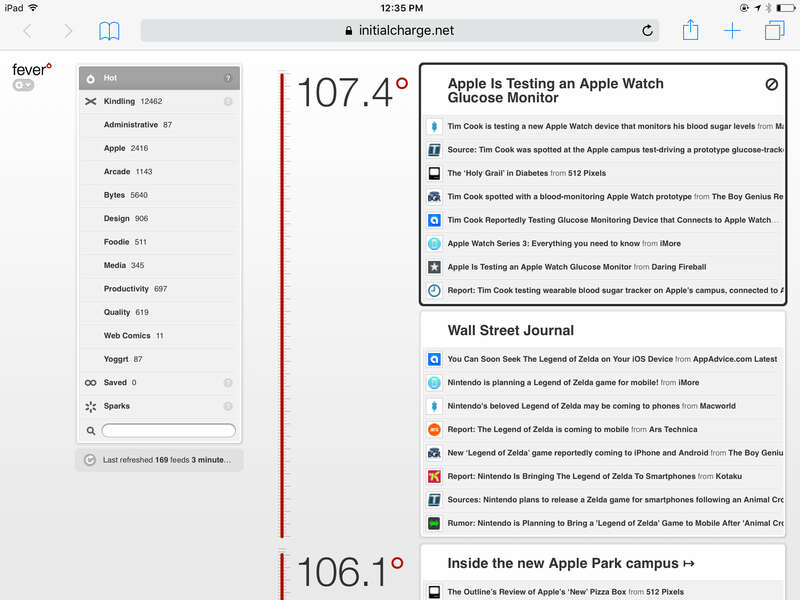 Up until last month, I had been using Fever as the backend for my RSS, syncing with Reeder as my primary client. Fever was a tremendous product by Shaun Inman that I first started using shortly after it launched in 2009. 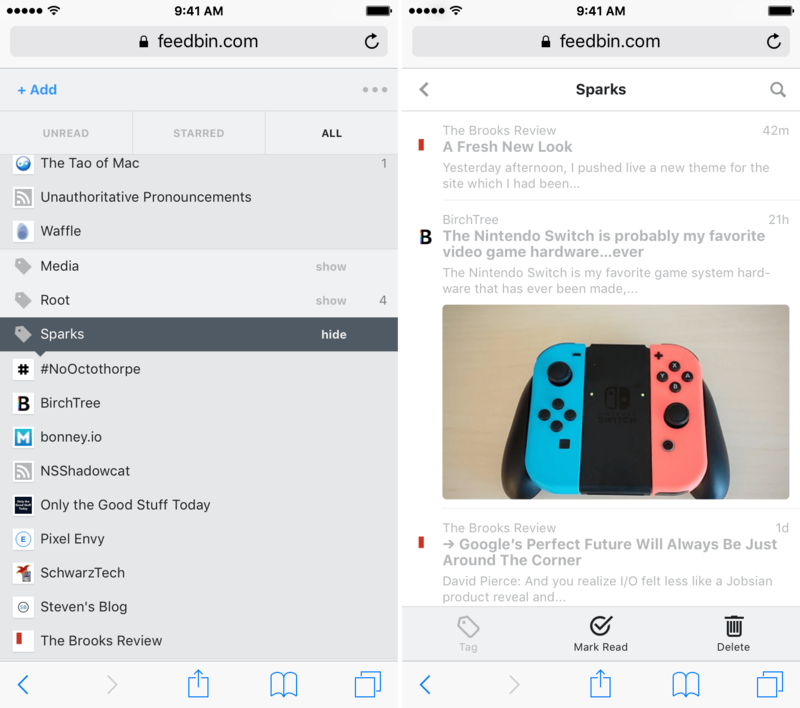 It was a self-hosted RSS reader with an API for developers; a beautiful user interface; and a neat “Hot” feature which listed all of the webpages your feeds have linked to, over a given time period, sorted by frequency. Fever’s Hot feature was, by far, the most innovative part of the software. And to this day, I’m not aware of any other RSS service that provides this sort of functionality. It let you step away from your feeds for a few days and quickly catch up with the most important news items without having to sift through everything — Fever did all the heavy lifting for you. I’ve been a huge fan of Shaun Inman’s software for years — I reviewed Mint and Fever around the time I first installed them and they’ve been my favorite web analytics and RSS syncing services ever since. But the writing’s been on the wall for both of them for quite some time — development has drastically slowed over the past two years. I expect I’ll continue using them for a while, but eventually I’ll have to migrate to something else. I still use Mint for Initial Charge’s web stats, but last month I transitioned to Feedbin for all of my RSS syncing needs. The process for choosing Feedbin over all of the alternatives wasn’t exactly comprehensive. The only services I considered were the ones that Reeder had support for and I only actually tried one them. There may be other, better services available, but I’ve been more than happy with the decision I made. Looking through Reeder’s “Add Account” view, my options were Feedbin, Feedly, Feed Wrangler, FeedHQ, NewsBlur, The Old Reader, Inoreader, Minimal Reader, and BazQux Reader. I immediately ruled out all of the services with ugly logos or poorly designed websites. It may seem shallow, but you can usually learn a lot about whether or not a service is going to click for you based on those two factors. And, honestly, life’s too short for bad design. That left me with Feedbin, Feedly, FeedHQ, and Minimal Reader as the front-runners. I started browsing each of the service’s websites for pricing information or unique features that would pull me toward one of them. After some investigating, I remembered a piece I wrote from last year about a nifty feature added to Feedbin — email newsletter support. That’s all it took. I signed up for the free trial and became a paying customer just a few days later. There has been a big resurgence of email newsletters as of late, especially from the independent technology weblogs that I frequently read. I’m interested in reading this supplemental content, but my inbox isn’t exactly the place where I want to be reading this stuff. I don’t want anything emailed to me that I can’t act upon quickly. And long-form prose often sits for weeks before I have a chance to read it. I want this sort of content in my RSS reader, where I can either read it immediately or save it for later, depending on my available time. A feed list with bulk actions and sorting: After importing my OPML file, I was able to sort all of my feeds by most recently updated. This surfaced all of the, what I believe to be, abandoned feeds and I was able to unsubscribe with just a few taps. And to further thin the herd, I sorted my feeds by volume and unsubscribed from some of the more frequently updated sites that I’ve lost my enthusiasm for. Actions: This allows you to automatically mark as read or star any feed item that matches a chosen search term. If you’re trying to cut down on the amount of political talk you encounter on a daily basis, this will work perfectly for you. One of the best aspects of Feebin, though, is its honest business model. You pay a monthly or yearly fee — I signed up for the $30 per year plan — in exchange for the use of Feedbin’s web app and syncing service. Some of the other services weren’t exactly up-front with their pricing — either omitting it from their homepage or making it almost impossible to find without the help of a search engine. Feedly was the worst offender of this, which is surprising because of how well-known they are. From Feedly’s homepage, I couldn’t find any information about what they charged for their services. I had to search DuckDuckGo in order to find this page that explains all of the pricing tiers. I guess this information is only surfaced for registered users with free accounts. That seems a little dishonest to me. There’s no indication of premium accounts on the homepage and there are even two “Get Started for Free” buttons that could mislead new users into thinking that all of the features listed on the homepage are free for everyone, which is not the case. Many of the features listed on the homepage require a premium account. Compare that to Feedbin. They have the monthly pricing information in the header, right above a “Try it Free” button. They aren’t trying to trick you into signing up with a false sense that you can just use all of the features without paying. Feedbin is honest and up-front with their potential customers, letting them know exactly what they’re getting into before signing up. That’s the kind of company I want to give my money to. And of course, it helps that they have a well-designed service with great features and competitive prices. I expect I’ll be using Feedbin for many years to come.